Serving our Campus and Community. Educating for Ethics. Serving our Campus and Community. The California State University, Bakersfield (CSUB) Ethics Bowl Team competed against the California Correctional Institutional (CCI) Team in Tehachapi Prison for their second annual competition on January 25, 2019. This event provides a unique opportunity for students and inmates alike. The students and inmates have the opportunity to engage in open discussion about education and incarceration and both groups get the opportunity to put ethics and debate skills learned over the last several months to the test. Unlike in a Debate, where each team chooses and defends opposite sides of an issue, an Ethics Bowl is collaborative and focuses on presentation skills and developing the best argument in relation to an ethical dilemma (as opposed to merely scoring points against the opposing team). The two ethics cases argued by CSUB and CCI at this recent competition were whether convicted felons should be able to vote and whether it is possible to be “transracial”. Judged by several CSUB faculty members, CSUB won the competition by a narrow margin. The CSUB team is sponsored, in part, by the Kegley Institute of Ethics and CSUB School of Arts and Humanities, and begins in an Ethics Bowl course offered each fall through the Department of Philosophy and taught by Dr. Nate Olson, Associate Director of the Kegley Institute of Ethics and Assistant Professor of Philosophy. The goal is for students to gain an appreciation for the value of employing philosophical arguments outside the classroom. 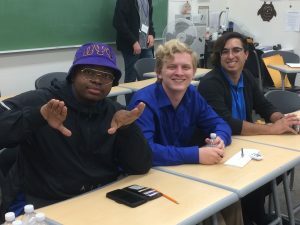 To this end, students scrimmage with the Bakersfield College Ethics Bowl Team, participate in the California Regional Intercollegiate Ethics Bowl competition, and exchange views in the annual competition with CCI inmates. 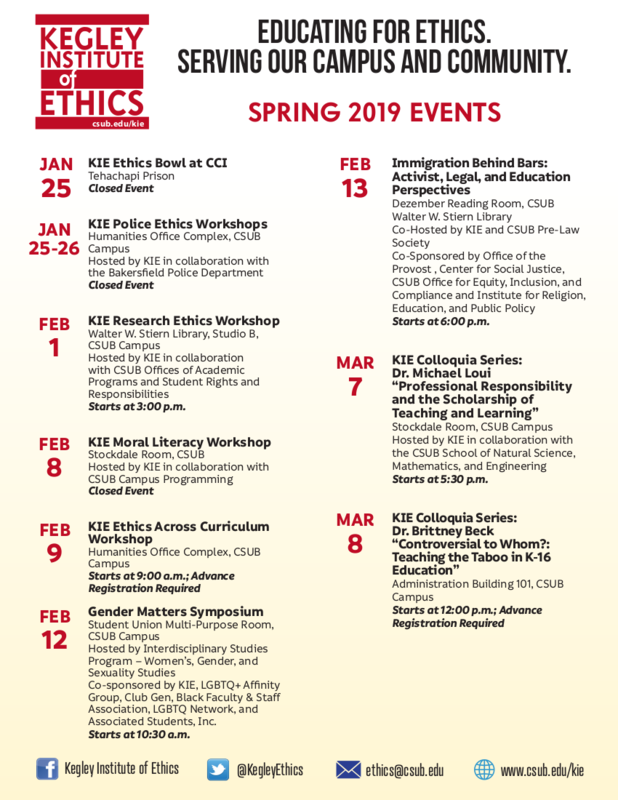 The Ethics Bowl class is part of an award-winning program at CSUB and the Kegley Institute of Ethics designed to promote community engagement and service learning throughout Kern County. The CCI inmates that compete are part of a unique program within CCI’s mental health department. The program is implemented by clinician Dian Grier, LCSW, and designed to create meaningful experiences for inmates while fostering good mental health and personal growth. Such groups provide constructive efforts toward rehabilitation by teaching empathy and enhanced listening skills while promoting anger management, critical thinking, and a sense of empowerment. This task-focused approach gives inmates the opportunity to view issues from other points of view and to accomplish goals with their team members through researching topics and training for the competition. Overall, this Ethics Bowl between students and inmates is a win for students, inmates, and our community as a whole. Please supply your name and email address to be put on our list and be one of the first to know about upcoming events, special lectures and much more!